In 1946, the year “No Regrets for Our Youth” was released, two significant events took place in connection with the incident depicted in the film, “Kyoto University Case (Takigawa Incident)”. First, what was “Kyoto University Incident“? In 1933, Yukitoki Takigawa, a Professor of Law School in Kyoto Imperial University, was accused of spreading Marxist ideas through his lecture, “Leo Torstoy’s view on criminal law through ‘Resurrection'”. The Ministry of Education, headed by Ichiro Hatoyama, ordered the University to expel Takigawa. The board of University Professors refused it at first, but the pressure from the military-political machine was so immense that they finally gave in. Students expressed their protests to no avail. This was a forerunner of another incident of academic purge two years later, also resulting in expulsion of a Law School professor, this time of Tokyo Imperial University, Tatsukichi Minobe. Takigawa, who was not a Marxist in any sense, was a scapegoat of political climate at the time. There were factions of extreme right wing thinkers and activists, rallying with military and conservative politicians during thirties. These fanatic activists exploited public fear against Communism to frame whoever they thought “too liberal”. The torch bearer of this ultra right wing movement was Muneki Minoda, who initiated the waves of accusations against Takigawa and Minobe. The character of Professor Yagihara (Denjiro Okochi) in this film is loosely based on Takigawa, who regained his professorship in 1946 under Allied Forces’ direction (1). The synchronicity must have been too obvious for the audience at the time. Another event of significance is not depicted in the film. Muneki Minoda, the fanatic activist, committed suicide in his birthplace earlier that year. 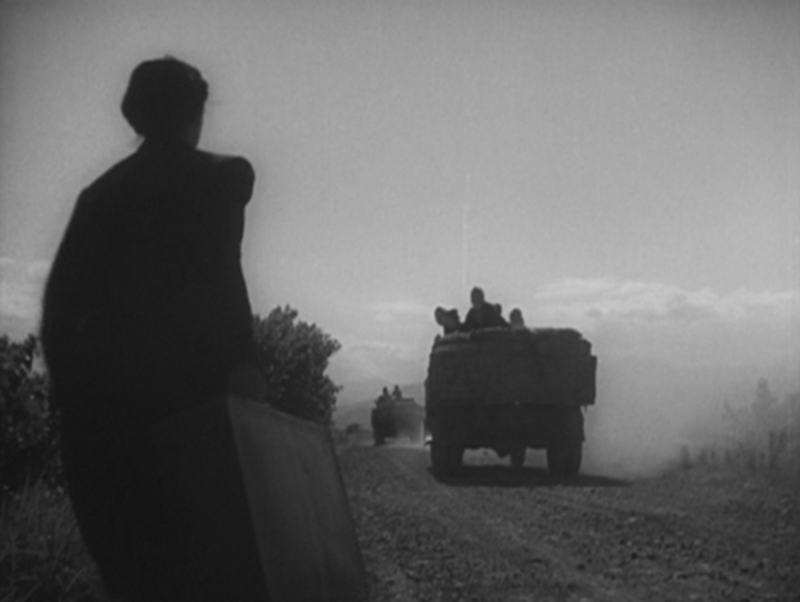 In fact, activists and other political figures who were responsible for Yagihara’s expulsion were never visible in the film. The presence of such political machines is only vaguely suggested through Itokawa (Akitake Kono) and a detective of Tokko (Japanese version of Gestapo), Hebiichigo (Takashi Shimura). Another true story on which the film is loosely based on was the Sorge Ring Incident, and specifically espionage by Hotsumi Ozaki. The character of Noge (Susumu Fujita) is vaguely reminiscent of Ozaki, but the real-life spy had never revealed his activities even to his wife. Ozaki had no connection with Professor Takigawa or his family. In the film, the fictional relationship provides the tense backdrop for the story of Yukie (Setsuko Hara). During the years of Allied Occupation, SCAP (Supreme Commander for the Allied Powers) heavily censored films to de-militarize, de-feudalize their contents. Samurai-period films with sword plays were forbidden. Any description of royalty over humanity was not allowed. Especially immediately after the war, there was strong tendency to “re-educate” Japanese public for democratic society. David Conde of Civil Information and Education (CIE) Section of SCAP, heavily involved in “democratization” of the film industry. His supervision over film production during 1945-46 period had resulted in “Aruyo no Seppun (1946, the first kiss scene ever in Japanese film)”, “Ozone ke no Asa (1946, condemnation of Japanese officers)” and this film and others. However, looking back, this film seems oddly communist-friendly. (Some suggests Conde being a left-wing “New Dealer” (2).) Especially treatment of Noge is peculiarly sympathetic, considering the real counterpart, Ozaki, was a Soviet spy. I do not know how much of Sorge Ring Incident was known to general public at the time, but this must have made those who knew uneasy (3, 4). As for “re-education” value, this work does address the issue inherent in Japanese society. The powerful sequence of the latter half (5), in which Yukie goes through the hardship and humiliation in the rural village, reminds us the very nature of the problem. This kind of branding and bullying was not an isolated phenomenon during the war. For example, families of war heroes were considered sacred and admired during the war, but many of them were publicly humiliated and stigmatized suddenly after the war. Bullying occur under any political environment, economical status or social context. Even now, the bullying and malicious branding among kids is depressing issue in schools. But it is an awkward theme to deal with in entertainment films. I wonder how the audience in 1946 reacted to this film. Not only preachy content must have left somewhat uneasy feeling, but also they must have recognized most of the cast had been in propaganda films a few years earlier. Susumu Fujita had played hero pilots and Setsuko Hara had been featured in a variety of politically motivated films (6). I believe this “atonement” must have made serious impact on audience. More so than political message it tries to convey. (1) Later, Prof. Takigawa was elected Dean of University of Kyoto. He was known to be a “dictator” of the University and considered to be reactionary. (2) David Conde was relieved of the duty as a CIE officer in 1946. He was employed by Reuters to cover Tokyo War Crime Trials, but eventually expelled from these proceedings by Douglas MacArthur. Though he is completely unknown outside of Japan, almost all Japanese film history books and literature refer to him as a key figure in postwar film industry. (3) Hisaita, the screenplay writer of the film, is known to be a serious left-wing writer. He eventually wrote for three more Kurosawa films. (4) ”Spy Sorge”, a film by Masahiro Shinoda, faithfully documents the incident. (5) The film was produced during the first stage of TOHO Worker’s Union Conflict, and the Union demanded Kurosawa and its writers to rewrite the original story. Strange it might seem, but a younger first-time director was making a film similar to Kurosawa’s, so the Union wanted the older Kurosawa to compromise on the screenplay. The latter half of this film was the result of rewrite. (6) Tadao Sato, a film critic, was a teenager when he saw this film in 1946. He said he didn’t like the fact that Susumu Fujita was playing a freedom fighter.